If you a one of the Popcorn Hour C200 users, this article may be helpful on how to put/stream Blu-ray movies to Popcorn C200 for enjoying. As far as we know, Popcorn Hour boxes play almost any media files that have been transferred to it, including Internet videos, DVR recordings, Camcorder shootings, even DVD and Blu-ray movies that have been ripped are supported. So, how to enjoy Blu-ray movies on Popcorn C200 is not a problem any more. The main problem seems to be how to rip Blu-ray to Popcorn C200 with high video quality and smooth playing experience. Most Popcorn Blu-ray video converter can not ensure the high video quality. So, it is always boring to find a useful Blu-ray to Popcorn C200 ripper to fulfill the task. Pavtube Blu-ray Ripper is the one you need that can help you convert Blu-ray movies to Popcorn C200 for smooth playing with rather good video quality. Required Tool: A Windows PC runs Pavtube Blu-ray Ripper, with accessible Blu-ray Disc drive. Step 1: Run Pavtube Blu-ray to Popcorn C200 ripper, and click “Load from BD ROM” button to import movie files from Blu-ray Disc. Keep the Internet connected during the conversion, or the program will come to a crash at the end of conversion. Step 2: Choose output titles, audio tracks and subtitles to keep. Simply expand main title, and tick off the audio and subtitles you don’t want. 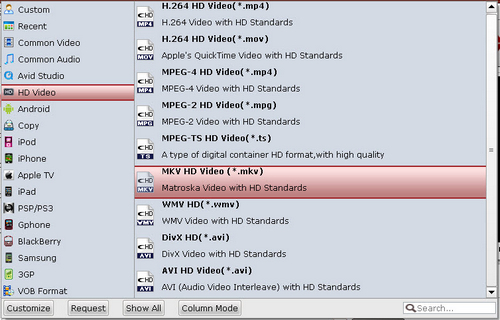 And then you can choose output format follow >> Format bar >> HD Video >> MKV HD Video (*.mkv). Step 3: Change the profile settings by clicking the settings button for converting Blu-ray to Popcorn MKV. 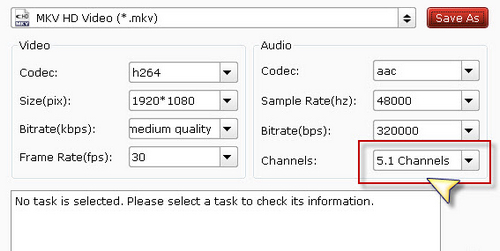 The HD MKV videos are encoded with h.264 codec and the video definition can be adjusted to 1920*1280 for playing in full screen. Besides, 5.1 channels can be kept in HD MKV videos for a higher audio quality when enjoying Blu-ray movies on Popcorn C200. Step 4: At last, you should come back to the main interface, and click the convert button to start to rip Blu-ray to Popcorn HD MKV videos. How to keep original/ correct aspect ratio for 16:9 and 4:3 display? How to Play Blu-ray Movies on Android Tablet? Blu-ray ripping- how to keep 5.1 and 7.1 audio? Android Blu-ray Video Converter-How to Play Blu-ray Movies on Android Tablet?